With the new Spider-Man series launching tomorrow, it’s time to announce the winners of our Spider-Man Subscription Contest! Congratulations to all the winners, and thanks to everyone who entered our contest! 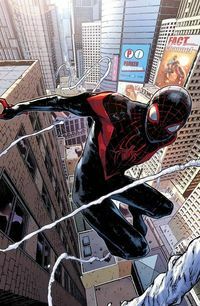 Miles Morales has been doing the super hero thing for a while, now he’ll be a full-fledged member of the Marvel Universe. Swinging next to the Invincible Iron Man, the Mighty Thor and the All-New Captain America as a card-carrying member of the Avengers is an adventure! What would it be like to be a man from the 5th Century–in control of technology that far outstrips anything the 21st Century has ever seen? 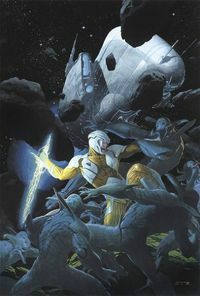 That’s the question put forth by X-O Manowar, an original comic book series from Valiant Entertainment. We held an X-O Manowar Contest that ended earlier this month, and we’re excited to announce the winners! Congratulations to our winners! You’ll each get a X-O Manowar #1 “talking” QR Voice Variant signed by series writer Robert Venditti, and a copy of Harbinger #1, Bloodshot #1, and Archer & Armstrong #1 as part of the contest! Stay tuned to the TFAW Blog for announcements on another hot contest soon! Fireworks and barbecues are all well and good—but at TFAW, we’re celebrating the 4th of July in style by offering brick-and-mortar customers a free back issue priced at $4.99 or less! Here’s how to get it: visit any of our Milwaukie, Hollywood, Beaverton, or Universal CityWalk stores July 2-4, and use your smartphone to “check-in” via Facebook Places. Once you “check-in,” the deal will unlock on your phone. Then just choose the back issue of your choice ($4.99 or less), present your phone at checkout, and you’re good to go! Remember to download the free Facebook Mobile app to your phone: get more info at Facebook.com/mobile. This offer is good once per person, and you must have your phone present to claim this special deal! Unfortunately, this offer is only good for our brick-and-mortar customers, but no worries, online shoppers: we have something special coming up for you this weekend–stay tuned! While you’re at it, remember to “Like” us on Facebook to stay on top of upcoming deals and promotions. Are you excited to get a free back issue for the 4th of July? Post your comments below. Win Tickets to Legend of the Fist in Portland! This Friday, Variance Films is releasing their newest action-packed film, Legend of the Fist: The Return of Chen Zhen, at the Hollywood Theatre at 4122 NE Sandy Blvd. Portland, OR, and you can see it for free! Here’s how: go to our Beaverton, Hollywood, or Milwaukie locations this week and perform your favorite “kung fu” move (we’re using the term loosely here, folks) to get a free ticket you can use for any showing of the film the week of April 22! We’ll post a photo of you kung-fu fighting on Twitter to show off your prowess, and get some video footage so you can experience some YouTube fame. Movie Synopsis: Seven years after the apparent death of Chen Zhen, who was shot after discovering who was responsible for his teacher’s death (Huo Yuanjia) in Japanese-occupied Shanghai. A mysterious stranger arrives from overseas and befriends a local mafia boss. That man is a disguised Chen Zhen, who intends to infiltrate the mob when they form an alliance with the Japanese. Disguising himself as a caped fighter by night, Chen intends to take out everyone involved as well as get his hands on an assassination list prepared by the Japanese. Are you excited to see Legend of the Fist: The Return of Chen Zhen? Post your comments below! New Flashpoint Issues + Freebies! I don’t know about you, but I’m pretty psyched for DC’s Flashpoint. Geoff Johns is helming the mega-event, and I get the feeling that this will be the story of the year! We just added 22 new Flashpoint issues last week, so make sure you check ’em out! This is not a dream, not an imaginary story, not an elseworld. This is Flash Fact: When Barry Allen wakes at his desk, he discovers the world has changed. Family is alive, loved ones are strangers, and close friends are different, gone, or worse. The event consists of the Flashpoint series proper, a host of three-issue miniseries focusing on key players in the DCU, several special one-shot issues, and a few crossover issues that will affect ongoing series. If you’re looking for a little something extra, check out the first wave of Flashpoint Action Figures or these cool Flashpoint T-shirts. Now to the extras! Be the first kid on your block to have his (or her) very own Flashpoint Ring! Just order the Flashpoint #2 w/Flashpoint Ring and we’ll take care of the rest. Finally, we’re excited to announce that 16 special Flashpoint issues will ship with a special pin unique to each issue. We’re including these pins FREE with each issue ordered, so make sure you reserve yours today! We’re loading up and getting ready for Emerald City Comicon! We’ll be at Booth #612 with great deals, awesome product, and cool signings with John Layman, Jeff Parker, Gabriel Hardman, Steve Lieber, Erika Moen, Jeremy Barlow, and so many more–check out our schedule. Are you going to Emerald City Comicon this year? Post your comments below! Part man. Part machine. All cop. The future of law enforcement returns! Dynamite Entertainment presents the dynamic debut of their Robocop series written by Rob Williams (Cla$$war) with art by Fabiano Neves (Marvel Zombies vs. the Army of Darkness)! 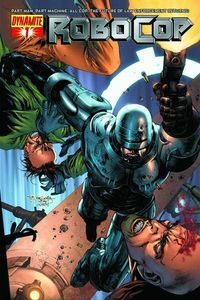 Dynamite goes back to basics as it unveils the dystopian, deeply satirical, and all-out violent world of Robocop. This Robocop series picks up where the first movie left off and boasts high action and extreme violence with a touch of conspiracy theory. Plus: the return of ED-209! We couldn’t be more excited to see our favorite crime fighting future policeman back in print, so we put our noggins together at TFAW Headquarters to give him an appropriate send-up. While supplies last, you can pick up the first issue of Dynamite’s new Robocop series and get a FREE mini Robocop figure complete with busted ED-209! The Robocop #1 Book and Figure Set is the same price as the the comic by itself (just $2.80 when you pre-order), but most customers will see $0.50-$1.00 difference in shipping (since we can’t send the figure in a flat mailer). 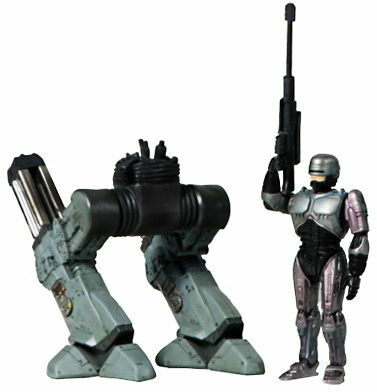 Stay tuned to future TFAW.com Newsletters to learn about the next Robocop Book & Figure set! Click here to sign up for the TFAW.com Newsletter. Buy a Gomic, Get a Lantern Ring for FREE! If you’ve been following the events in the DCU, you know that exciting events are unfolding! Coming at you this November are seven very special DC issues. Each of these Blackest Night crossover issues will ship with a different Special-Edition Lantern Ring. The cool thing is that we’re offering these sweet little rings to you at no additional charge. If you’d rather just order the comic book issue by itself, no problem! For those of you who do want the ring, just make sure the product title says something like: “Outsiders #24 w/ Violet Lantern Ring” and you’re good to go. Didn’t get the Black Lantern ring the first time around? How about this: if you pre-order all seven of the Comic/Ring combos in a single order, you’ll be automatically entered into our Black Lantern Ring Contest to win one of 25 Black Lantern rings! What do you think of DC’s Ring Promotion? Are you ordering any of these issues? Let us know below! The Anchor. Holy warrior, unholy war. Freak of nature, beast of burden, hulking outcast, medieval prize fighter, Viking raider, God’s leg-breaker. One thousand years ago a hulking outcast sought refuge in the crumbling ruins of an ancient monastery, offering in return the one thing he had to give–his fists. Transformed into an immortal warrior monk standing at the gates of Hell itself to keep our world free from its invading armies, The Anchor is mysteriously tricked into centuries of slumber. But today, this holy warrior rises to battle all the unholy monsters unleashed during his slumber. We had the chance to chat with Phil Hester and Brian Churilla, the creators of this exciting new series from Boom Studios! Here are the fruits of that chat. TFAW.com: Phil, you’ve spent a lot of time writing complex, dark stories and The Anchor certainly looks like it’s going down a similar road. What can you tell us about the tone of the book? What’s it going to feel like? Phil Hester (PH): In the same vein as The Coffin or Deep Sleeper, but with an emphasis on action. In the past most of my protagonists have been everyman types thrown into bizarre situations. 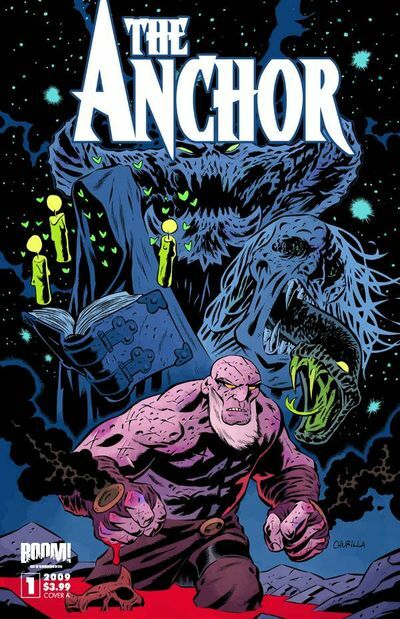 In The Anchor, the main character is the bizarre factor thrown into our world. So, while I hope fans of my work find the same kind of thoughtfulness they found in my other books, there will be a lot of balls-out fight scenes. I’d say “teeth rattling” would best describe the feel of the book. TFAW.com: Little saint, God’s leg-breaker? Is it safe to say that religion will play a key role in The Anchor? PH: Only obliquely. The Anchor is a Christian monk, but we’ll see in the first issue that he doesn’t even know what a psalm is. His training, we’ll come to find out, is very unorthodox. As far as he knows his powers come from the almighty and that’s good enough for him. We don’t dig much deeper than that. There’s no time for navel gazing in his world or our funnybook. It relates to Christianity about as accurately as The Mighty Thor does to worshipers of Odin, but there’s certainly no effort to demean it at all. TFAW.com: Starting a brand-new series and establishing mythos must be very exciting and exhausting. What can you tell us about our hero and how’d you come up with his name? 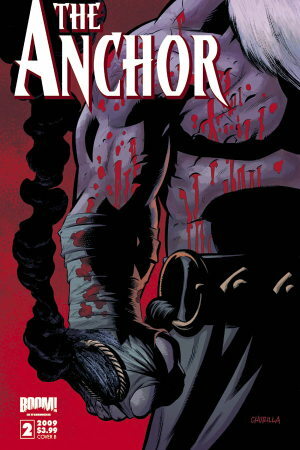 PH: The Anchor doesn’t have a full recollection of his own identity in issue #1, so we’ll be learning along with him. I hate to spoil plot points, so I’ll just say that every time The Anchor kills a monster, he gets a little bit of his memory back. Here’s what we know: He’s basically Gandhi’s soul in The Incredible Hulk’s body, his soul is in hell preventing demons from invading Earth, the wounds he suffers in hell show up on his body on Earth, and he’s on a mission to destroy any demonic critters that make it to our world. The name came from stumbling across the practices of Anchorite monks, who walled themselves up in the foundations of churches to prevent outside influence. That extreme commitment to a cause is both startling and inspirational. What kind of person does that? A person who has rejected the world as he or she sees it and is looking for something else. 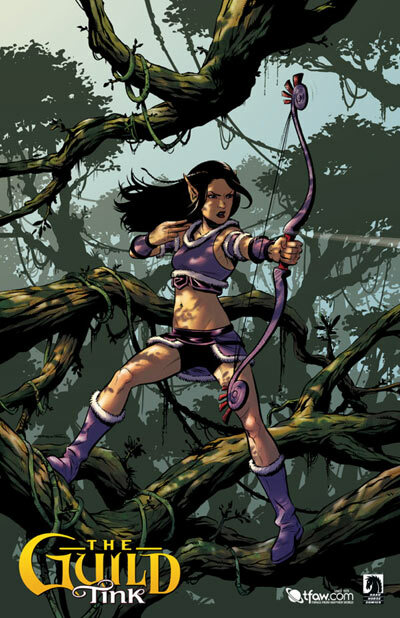 Also, we’ll see that our main character has other reasons for the nickname when we get a flashback in #2. In the end, it implies a rock-solid base, unwavering strength–that’s our guy! TFAW.com: Has this idea been simmering for awhile or did inspiration hit you recently? PH: It’s pretty recent. I cooked it up just for Brian to draw. TFAW.com: How did you two come to meet and work together? PH: I’d been an admirer of Brian’s work since I saw it in the Archaia book, The Engineer. I emailed him to buy some pages and we hit it off well enough to work together. I sent Brian my list of 20 or so unpublished proposals and he rejected them all! As I said earlier, my heroes tend to be average Joes, and Brian wanted to draw an iconic character. I was turning all that around in my head when I saw a travel special about anchorite monks at Lindisfarne. He seemed to dig it and away we went. TFAW.com: Brian, you’re a relative newcomer on the comics scene, where have you been hiding? I mean, your art is pretty incredible. How is it that we haven’t seen a lot more of you? Brian Churilla (BC): I’ve been around, cutting my teeth for a while now. I started out doing a graphic novel with Fred Van Lente called Watchdogs, went on to do The Engineer for Archaia, Dark Horse Presents, Rex Mundi, Creepy for DH and We Kill Monsters with Red5, to name a few. I’m definitely doing my best work in The Anchor because aesthetically, it’s smack dab in the ol’ wheelhouse, so I feel very inspired. TFAW.com: How has the character design process gone? Has The Anchor changed a lot since his initial inception? BC: There have been some changes for sure, but overall, he’s retained his likeness since his initial design. There are a lot of monsters to design, a lot, and who wouldn’t want to draw monsters all the time? TFAW.com: Anything else we should expect to find in The Anchor? PH: I think there will be a more romantic bent to this than anyone might suspect looking at the previews and first issues. Also, I can’t help myself, even though this is billed as a punch-up kind of comic, it will get heavy and/or touching when you least expect it! TFAW.com: Let’s say I’m a reader who’s on the fence about The Anchor. How are you going to push me over the edge? What’s your used-car salesman pitch? 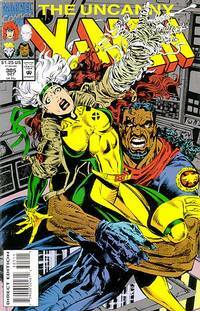 PH: There’s an under-served market in comics, and that’s readers craving smart action. We get plenty of dumb action from superhero comics and plenty of smart shoe gazing from lit comix. We’re trying to wrangle the best of both worlds. I think we offer thrills and spills coupled with plenty of emotionally resonant moments and witty dialogue. Imagine Michael Chabon writing play by play for a demolition derby. That’s us. Thanks for taking the time to talk with us about The Anchor, guys. We’re eagerly awaiting October 28th. For those of you who’d like to see a bit more of the book, check out the First Look. The first issue is available for pre-order now, so hurry and get your copy while you can. 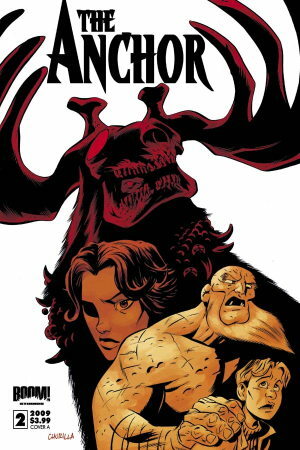 Phil and Brian were also kind enough to give us some signed copies, so be sure to pre-order The Anchor #1 or comment below and we’ll throw your name in the hat to get one of those coveted copies! If you’ve been into comics for awhile, you know that the first Saturday in May is a very special day. It’s hard to believe that Free Comic Book Day (FCBD) is less than a week away! FCBD is about introducing people to new comics and showing kids that reading can be fun. We’re excited to announce that we’ll be including THREE FREE COMICS with every in-stock order this weekend starting at 12:01 AM (PST) on Saturday. We’ll only slip these free comics in with your order while supplies last, though, so it’s first come, first served. 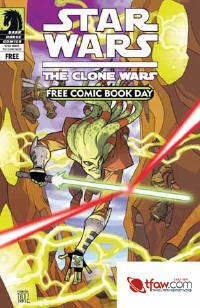 First up, we’ve got Star Wars: Clone Wars, which will be included with every order. This is a special issue featuring the greatest heroes of the Clone Wars, plus Emily the Strange, Usagi Yojimbo, and other all-ages favorites! Then, we’ll randomly pack either Blackest Night #0 or The Avengers. Please keep in mind that we won’t be able to take requests for specific issues. 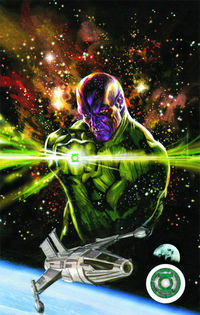 In Blackest Night, DC Comics will debut the prelude to Blackest Night, which stands to be the biggest comics event of 2009! The issue also features an introductory text page that sets the stage for new readers. 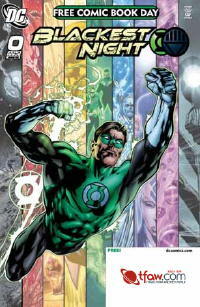 The issue includes a lead story that leads directly into Blackest Night #1, as well as a special guide to the various Corps that have recently emerged as forces in the world of Green Lantern. 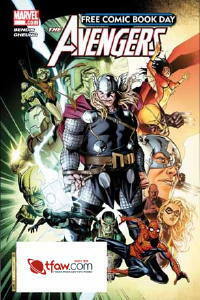 In The Avengers, the mighty Thor and both the New and Dark Avengers join forces against the frost-giant Ymir in a battle that will have terrifying consequences for the Marvel Universe–and for these heroes–in the days to come! Top-flight creators Brian Michael Bendis and Jim Cheung combine talents to bring you an absolutely essential all-new touchstone story for what’s coming up in the Marvel Universe! Also included with every order is Aliens/Predator. In the next few months, we’ll see the re-launch of two of the quintessential Dark Horse movie-to-comics franchises–the Fox blockbusters Aliens and Predator! 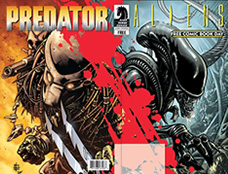 Featuring a flip-book format with two covers and two stories–each devoted to one of mankind’s deadliest adversaries–the FCBD Aliens/Predator comic opens the airlock to a new universe of terror! FCBD 2009 is going to be a great one! Excited about one or more of these books? Let us know below! You already know about our Grab Bag Comics, so we’d like to introduce you to the newest addition to our Grab Bag lineup: Grab Bag Graphic Novels! Remember the feeling you had when you were a kid and you were waiting for a package to come to you in the mail? You can experience that feeling once again, and best of all, you don’t have to make a huge commitment. Since our Grab Bag Graphic Novels are only $3 apiece, you can forget about the bills and junk mail and actually be excited to open your mailbox. Just pick your publisher and how many graphic novels you want, and we’ll take care of the rest! What do you think about the idea? Would the mystery be too much to bear at $3 each? 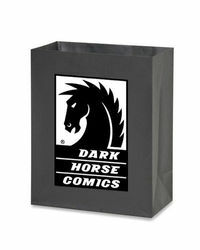 Have you had a good experience with our Grab Bag Comics and think this is a good idea? Let us know below*. *We’ll pick five of our favorite comments on this blog post and send a Grab Bag Graphic Novel to the winners on Monday.